Erin and Joan are in New York this week for BookExpo America. We're looking forward to seeing many friends, colleagues, and clients! The International Reading Association is one heck of a great organization. It is a global network of more than 70,000 members, all committed to increasing literacy worldwide. As part of this, each year they recognize books that they believe will encourage children and young adults to read. We are so pleased that two EMLA authors are on the 2010 IRA book lists! Jennifer Ziegler's How NOT To Be Popular is on the 2010 Young Adults' Choices Booklist (scroll down to a link to the bookmark showing the whole list; the annotated version will not be out until November). This list is chosen by teen readers themselves. Liz Garton Scanlon is the recipient of the 2010 Children's Book Award in the category of primary fiction for All the World. This award is given for an author's first or second book, and is chosen from an international field. Associate agent Ammi-Joan Paquette is a woman of many talents: She is an agent and an author. Now she is a picture book author (her first picture book, The Tiptoe Guide to Tracking Fairies, was released by Tanglewood Press last spring) and a novelist, to boot! Joan's lyrical first novel, Luchi, Undaunted, was just placed with Stacy Cantor at Walker Children's. It's tentatively scheduled for a winter 2012 release (early 2012). In the novel, a thirteen-year-old girl born and raised in a Thai prison ventures out into the world after the death of her mother, seeking to uncover the secrets her mother left behind and find the American family she has never met. Enter The Monstore … If You Dare! I have some very exciting news to share for a fairly new EMLA client: Tara Lazar signed on with the agency in March, and has just accepted an offer for her first picture book: The Monstore. As you might guess, this is a shop that sells very useful monsters, just right for doing tricky stuff around the house. The Monstore has only one rule: No refunds, no exchanges. In other words… what could possibly go wrong? The picture book deal is with Emily Lawrence at Aladdin/Simon & Schuster, and will be released in summer 2012. Congratulations, Tara!—I can’t wait to see what the illustrator does with this hilarious tale of monsterly hijinks! Audrey Vernick is another EMLA client who is having a heck of a year. 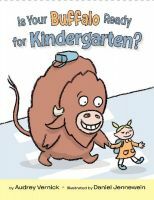 Her fun picture book Is Your Buffalo Ready for Kindergarten? debuts next month with HarperCollins, and her touching nonfiction picture book She Loved Baseball: The Effa Manley Story, also published by HarperCollins, will debut this fall—and she has three more picture books under contract, with three different publishers, scheduled to come out over the next two years! Now, though, Audrey is headed into brand-new territory: Her first novel, Water Balloon, was just acquired by Jennifer Greene of Clarion Books (publisher of one of her upcoming picture books, as well). Water Balloon is a contemporary friendship-and-first-love story set in the tender emotional territory of the summer before high school, when life is as delicate as a water balloon but as full of the potential for a big kaboom. It focuses on an unforgettable girl named Marley, who's just the sort of kid you'd want to be friends with. Water Balloon is tentatively scheduled to release in the fall of 2011. A GOBLIN Cover and a PRINCE of a Deal! Jennifer A. Nielsen has been having a terrific year thus far: The first book in her Underworld Chronicles series, ELLIOT AND THE GOBLIN WAR, is coming out on October 1st from Sourcebooks. The cover was recently finalized and it’s just gorgeous! Jennifer A. Nielsen’s THE ORPHAN PRINCE, in which three orphans are recruited to compete in a treacherous plan to impersonate a lost prince and thus prevent a civil war—but that’s just the start of the deception, to Lisa Sandell at Scholastic Press, in a good deal, in a pre-empt, in a three-book deal, by Ammi-Joan Paquette of Erin Murphy Literary Agency (World). Congratulations all around, Jen, and here’s to many more great things up ahead!